10. Sakura (Cherry Blossoms) – I was skeptical about all the hype surrounding cherry blossom season, but it really does deserve the hype. We had two weeks of cool, sunny weather in which to enjoy the sakura with friends in various gardens, parks, and even just driving around town. 9. New Year’s Party with Our Neighbors – In February, we were invited to our neighborhood New Year’s dinner party. We were apprehensive about going since we speak little Japanese, but we enjoyed connecting with our mostly senior-citizen neighbors through good food, bingo, and leading them in the “YMCA” during karaoke time. 8. 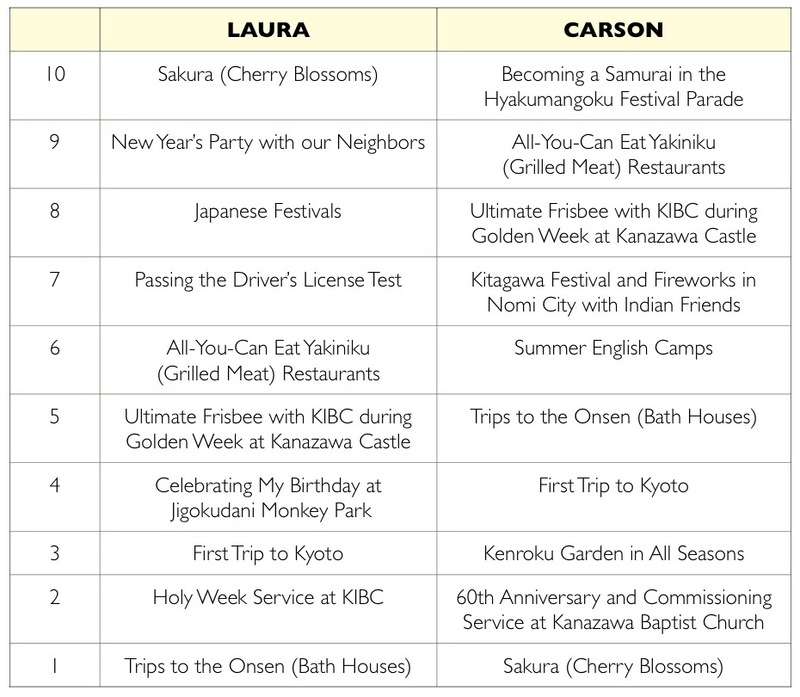 Japanese Festivals – America does not have something that truly compares to the experience of Japanese festivals. Parades and fireworks are common in both, but Japanese festivals elicit traditional attire, dances, and customs that have lasted for centuries. There is also a lot of setting things on fire and destroying parade objects. 6. All-You-Can-Eat Yakiniku Restaurants – This is hands-down my favorite eating experience in Japan. We always opt for “all you can eat”, and for 100 minutes you can sit at your table and cook plates of raw meat and vegetables on a small grill with your friends. It’s simple but delicious. 5. Ultimate Frisbee with KIBC Friends – During a national holiday, our international church hosted an ultimate frisbee event which brought out 30 people, some of whom we met for the first time. We played in the lawn at Kanazawa Castle Park and just had fun for hours. It was some of best ministry we’ve been a part of since coming to Japan. 4. Celebrating My Birthday at Jigokudani Monkey Park – As an American, the idea that there were places in the world where monkeys roam wild and free always freaked me out. So I don’t know why I thought I would enjoy a free-range monkey park for my 30th birthday, but I did and loved it. It’s probably because Japanese macaques are cute, furry, and like to soak in hot springs. 3. First Trip to Kyoto – Our first vacation in Japan took us to Kyoto, a former capital and a city that has some of best-preserved traditional Japanese culture. The temples and shrines are old, beautiful, and just so different from Western historical sites. They also have a Krispy Kreme. 2. Trips to the Onsens (Bath Houses) – I’ve told many people that the thing I will miss most about Japanese culture when we leave are the bath houses. For a few dollars, you can take a shower and relax in a variety of hot baths. The communal part of bathing can be uncomfortable for newbies, but it is incredibly relaxing and sometimes a great way to converse with others. 1. Holy Week Service – The Saturday evening before Easter, our international church gathered for a Tenebrae Service at Kanazawa Baptist Church. The service included foot-washing, hymn-singing, the reading of Jesus’ last days from the Gospels, and the extinguishing of candles. It was a simple but meaningful service and the first of its kind for many of our members. 10. Becoming a Samurai in the Hyakumangoku Festival Parade – In May, alongside friends I became a samurai. As part of the Hyakumangoku Festival, Kanazawa’s biggest and most famous event, we joined in Lord Maeda’s army together in the big parade. With spear in hand, I marched as a smiling solider, probably not completely authentic, but enjoyable all the same. 9. All-You-Can-Eat Yakiniku (Grilled Meat) Restaurants – Imagine this, you are challenged to eat as much grilled meat in 100 minutes as possible. This is not a Travel Channel exclusive; this is simply a category of restaurants in Japan. There is a small wire-covered barbeque grill in the middle of the table and you order off a menu of various sliced strips of meat and veggies to chow down on. You are on the clock from the first order, so quick work must be made to ensure you get your money’s worth! 8. Ultimate Frisbee with Kanazawa International Baptist Church (KIBC) – We joined friends from church, our students, and friends of friends during Golden Week in May on the grounds of Kanazawa Castle for a game of ultimate frisbee. For most, it was either the first time they had thrown a Frisbee or certainly the first time playing the very American game. We had lots of laughs and gained plenty of exercise together as we enjoyed a holiday together. 7. Kitagawa Festival and Fireworks with Indian Friends – It was a beautiful collision of cultures when we joined Indian friends from a local university in yukatas (cotton kimono for warm weather) alongside thousands of Japanese at the Nomi City festival and fireworks show. The show was over an hour long and was preceded by drums, fire, and dancing! 6. Summer English Camps – With the great help of our summer CBF Student.Go intern, Chip, we held our first English camps in July, one for adults and one for kindergarten and elementary student families. Playing water games, worshipping at KIBC together, and chowing on American food were just a few of the great moments of our weeks of camp. These events created opportunities for us to learn more about our Japanese and international friends and make new ones for the years to come. 5. Trips to the Onsen (Bath House) – My Puritanical, American mind could not wrap itself around how it was going to be fun to go and sit naked in hot water with a bunch of other men for a few hours last September. My enlightened and year-into-Japanese-culture mind is preparing to spend an entire day relaxing in an Edo era-themed onsen in Tokyo on vacation. 4. 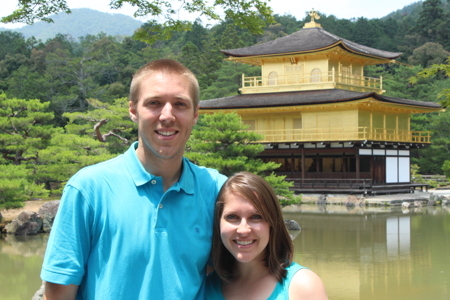 First Trip to Kyoto – The top tourist site in Japan for Japanese and internationals is Kyoto and there is a reason why. It displays the beauty and wonder of old Japan. Though a modern city has developed around the old sites, I was awed in December by the amazing temples, shrines, shops, and feeling of traditional Japanese culture and life. 3. Kenroku-en in All Seasons – We are fortunate to live just a short walk away from one of the country’s Three Great Gardens, Kenroku-en. Special events throughout the year also allow visitors to see the fall foliage, winter snow, spring cherry blossoms, and summer flowers during the day and night for free! 2. 60th Anniversary and Commissioning Service at Kanazawa Baptist Church – It was humbling that the church decided to celebrate our commissioning as it also held it’s 60th anniversary celebration as a congregation. We heard stories of the missionary family that helped to found the church, had hands laid upon us by church deacons, members from Toyama Koizumi-cho Church, our supervisors from CBF, and representatives from the Japan Baptist Convention, and had lunch together in the kindergarten hall following worship. 1. Sakura (Cherry Blossom) – From childhood, I had heard about the beautiful Japanese sakura, so it was no little event when these cherry blossoms exceeded my expectations. Laura and I participated in hanami (flower viewing) at Kenroku-en several times with friends, picnicked in a park by the river under the trees, rode bikes through parks full of pink, and even ate various sakura-themed and flavored foods this past April.